Two quick stops. Coffs Harbour, which apparently has the most liveable climate in Australia, with temperatures being 18-26 Celsius in the summer, and 8-20 Celsius in the winter. 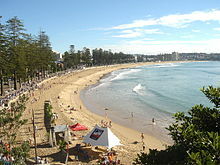 And Port Macquarie, where, in 1821, the town was founded as a penal settlement for convicts. The surrounding area has thick bush, ideal for any escapees to hide, but, sadly for them, the local aborigines were happy to return any convicts to the settlement in return for tobacco and blankets. 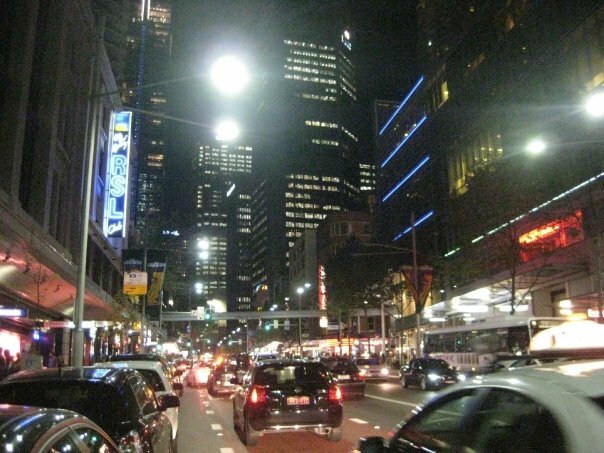 I arrived in Sydney at midday and got a taxi to the hotel. I had a wander to get my bearings-I always find that if you walk around, with or without a map, it’s the best way to get to know your way around quickly. I walked to Darling Harbour, which is one of my most favourite places in the world. It is a great place for people watching as you chill out in one of the many bars or restaurants. When the sun goes down the office lights come on and they create reflections of different colours in the water. It really is a sight to see, especially when you can see the sun’s reflection in the buildings. After a leisurely breakfast I walked to Circular Quay where you can see the Sydney Harbour Bridge across the water, and get up close and personal with the Sydney Opera House. The Opera House is impressive although, when you get up close to it, it doesn’t look as white as it does from a distance. I stood for a while and watched a guy playing the steel drums while another random guy was dancing round in front of him. It was quite amusing as the random guy wasn’t dancing in time with the music. Not that I am any John Travolta but it was quite amusing nonetheless! The following day I took a trip to Manly. 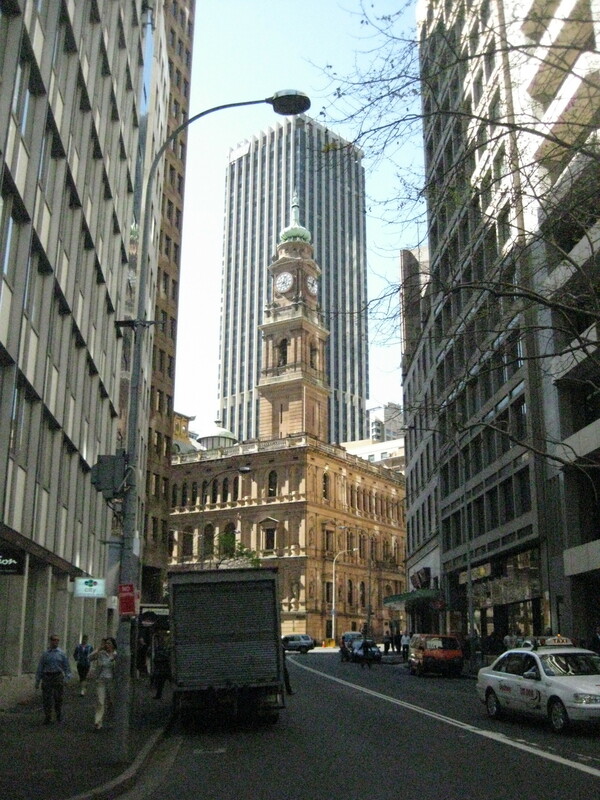 It takes about 30 minutes to get there by ferry from Circular Quay. I got off the boat and wandered through the town to the beach. I had barely got settled on the beach, when the sun disappeared and it got really chilly. So I packed up my things and went in search of a bar. 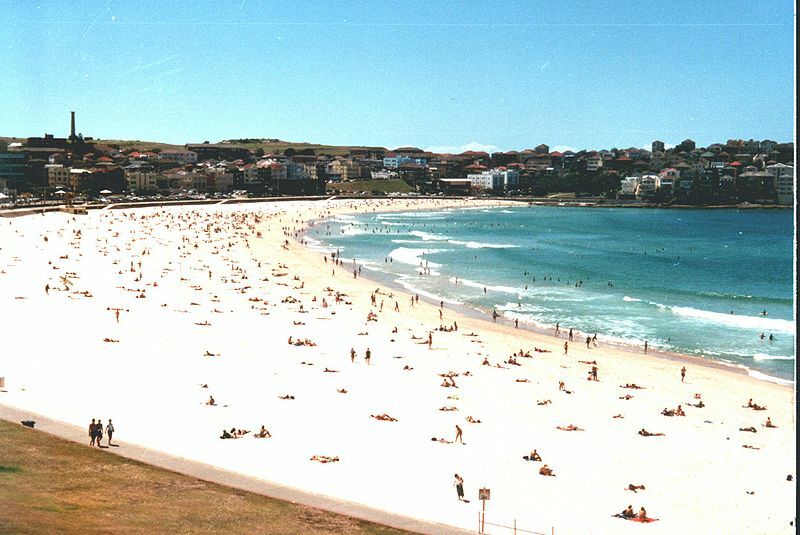 Bondi Beach was the next destination I wanted to visit, so I took a double decker train (Yes, train) from the city and arrived at Bondi Junction some eleven minutes later. It was only a short trip to the beach and first impressions are that it is a lovely arc shaped beach, nestled in a beautiful cove. However, in my opinion, it is completely over-rated and, from the way it is portrayed on TV and in images, it is actually not that big. It is certainly not the most beautiful stretch of sand I have come across. I stayed there for a couple of hours but the sun disappeared again, making it quite chilly. The sand was being blasted by the wind and this, in turn, meant that I was continuously blasted with sand. It wasn’t very pleasant so I wandered round the shops before heading back to Sydney. It was my birthday so I went on a trip to the Blue Mountains. The tour bus drove through a couple of little villages, Leura and Blackheath, to reach a lookout point. 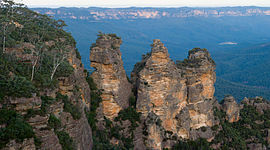 This is a great spot to view the “three sisters”, a natural rock formation in the Jamison Valley. The story behind the three sisters, named Meehni, Wimlah, and Gunnedoo, goes something like this- the sisters fell in love with three men of the Nepean tribe but this was forbidden, so the three men decided to take the sisters by force. This resulted in battle, with the sister’s Katoomba tribe on the losing side. The leader feared that this daughters would be carried away by the enemy, so he turned them into stone to protect them, but he was killed before he could reverse his spell. Afterwards we drove to the Blue Mountains resort and travelled down to the valley on the scenic railway. This is no ordinary railway. It is the steepest one in the world and it plunges deep into the valley floor. It was a little like being on a roller coaster, although it didn’t go as fast! At the bottom there is a board walk where you can walk through the many different species of trees, and learn about the old mining businesses that used to be there. The Blue Mountains are spectacular. Their name comes from the blue haze that can be seen from a distance. This happens when incoming ultraviolet radiation gets scattered by particles in the atmosphere, which creates a blue colour to any distant objects. The mountain area covers around 10,000 square kilometres and was declared a World Heritage Area by UNESCO in 2000. On the way back we stopped off at the Olympic Park, which was a purpose built village where the Sydney Olympic Games were held in 2002. It was very impressive. Later that evening I went out to celebrate my birthday. I had dinner and found a nice bar, where I met some guys from Melbourne who helped me celebrate. I left around midnight feeling a little tipsy but happy that I had had another great day in Oz.